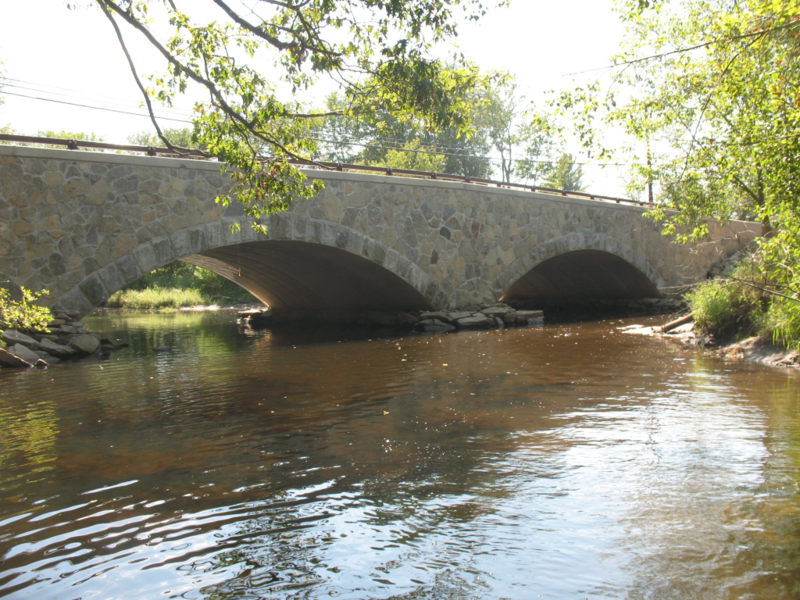 This bridge project is located in a rural area of Grafton, MA serving as an important link between the village of Saundersville and Grafton Center, as well as a connection to and from Grafton to Route 146 and the Massachusetts Turnpike. The original bridge was constructed in 1909 with two segmental stone arches is listed in the National Historic Register, however, due to foundation movement and settling the original structure could not be repaired. The new bridge was designed to replicate and restore the historically significant aspects of the original bridge and meet present day loading and safety criteria. In order to expedite the reopening of the long-closed bridge, MassDOT selected the design-build approach and the Bayside Engineering-SPS team for the bridge replacement and utilized an incentive clause to accelerate the opening of the new bridge. The design-build component allowed for site work and substructure work to progress into construction while the final design engineering progressed. As an example of that, the “Final Design Review – Highway Elements” started in early April 2009, just one week after environmental review and permitting had been completed and the Contractor had mobilized to start the demolition and site work. This project had many complicated issues that were all overcome with good communication, proper engineering and planning. 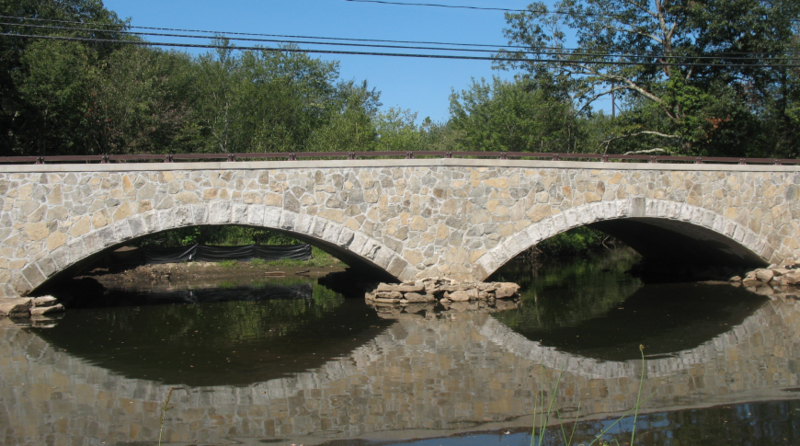 The more complicated issues included the historic restoration requirements, the control of the Blackstone River during construction and the very demanding deadlines to create, review and execute the critical submittals, obtaining necessary environmental permits and completing shop drawings. Additionally, this project had a number of other challenging site conditions, including water levels that fluctuated greatly, a gas line to be relocated, access requirements for adjacent properties and a very pervious river bottom that made dewatering the cofferdams difficult. Bayside Engineering developed 100% design review bridge and roadway plans in just four and six weeks, respectively to address environmental concerns, historic preservation and overall aesthetic appeal for this bridge. These requirements were implemented to satisfy local commissions, state historic preservation concerns and desire for a bridge that keeps with the rural character of the site. The old bridge, a double barrel stone arch, was deemed a worthy example of early 1900 stone masonry arch construction. Therefore, the project specifications included preservation measures that dictated replication and use in the new structure, certain contributing elements of original design such as the arch fascia ring stones. Permitting approval was another major complexity. Bayside and MassDOT team worked together, with the Department of Environmental Protection, the Army Corps, Endangered Species and the Conservation Commission to communicate, implement and monitor the intended construction and mitigation efforts. The construction of this bridge used four innovative techniques that enabled us to meet the project from the design inception to construction completion in just five months. The success of this bridge including design-build, environmental sensitivity and speed of construction resulted in the honor of receiving a 2010 award from the Construction Management Association of America (CMAA). As an “accelerated bridge” designee, the selection of a prefabricated precast concrete arch system was proposed. The custom arches were produced to closely match the original arch profile, which made possible field replication of original façade; original ring stones were attached to the precast arch fascias. The Contractor, in order to meet the accelerated schedule, elected to use precast components for the spandrels and wingwalls. 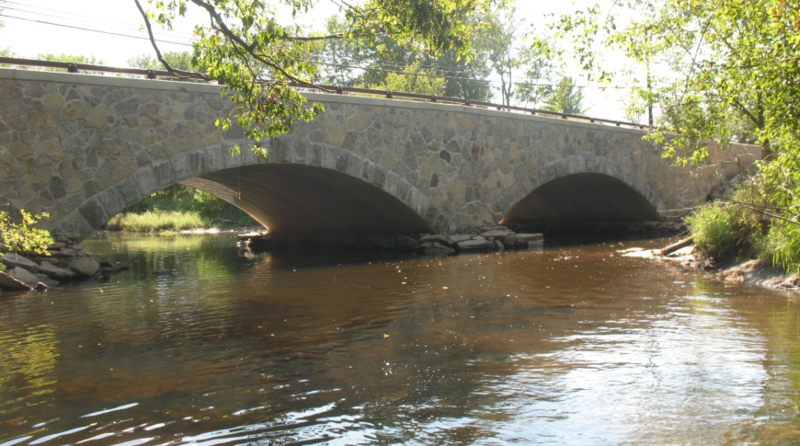 An innovative water diversion structure was utilized to control the Blackstone River and allow the construction of the bridge substructure. This system was chosen over conventional sheet piles for speed, vibration, flexibility of sequencing (from Phase 1 moved to Phase 2) and economics. Environmental permitting for this fast-track design build historic bridge replacement and replication project was the critical path for the success of this project. Bayside prepared necessary plans, documents and mitigation procedures needed to secure all permits and approvals from MA DEP (401 WQC), USACE (PGP), local Con. Comm. (Ch. 131 OOC), NHESP (endangered turtle protection), Local Historic Commission and MHC (MOA for historic bridge replication requirements) as needed to implement and monitor the intended construction and mitigation efforts. An innovative water diversion structure was utilized to control the Blackstone River and minimize environmental impacts and construction time. This system was chosen over conventional sheet piles for speed, vibration, flexibility of sequencing, which. 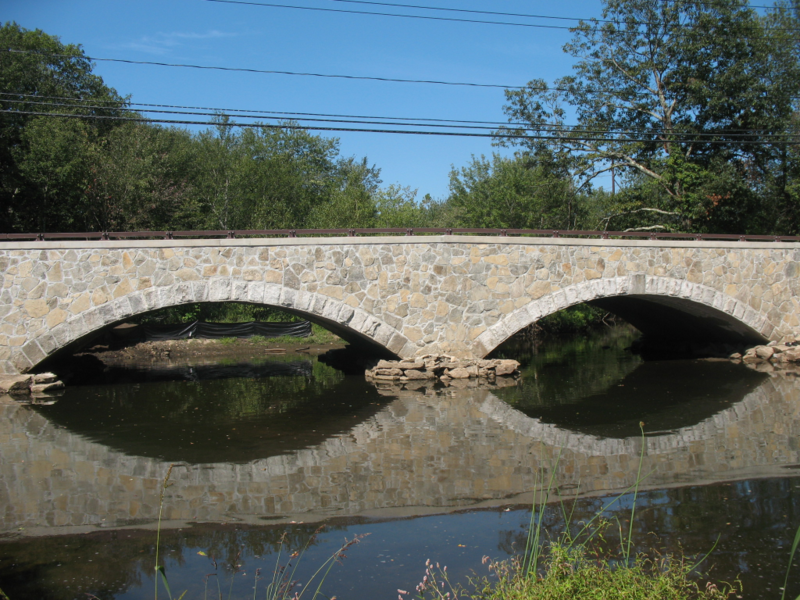 This project received a prestigious award from the Construction Management Association of America’s (CMAA’s) “Construction Management Project Achievement Award” for the Pleasant Street Bridge over the Blackstone River in Grafton. The construction of this bridge used four innovative techniques that enabled us to meet the project from the design inception to construction completion in just five months. Using conventional design and construction methods, this project would have taken over 18 months to design and construct. As a result of contractual incentives, design/build, a unique water diversion structure and the use of precast structural elements, the bridge was opened to traffic 64 days earlier than contractual requirements and was completed under budget.